Forget Broken Sword or Monkey Island, Phoenix Wright is coming to the iPhone (and supposedly iPod Touch) this week for 5$ (5€ ?)! Although I already went through it on the Nintendo DS, I’m hyped about this port. Anyone who commutes and enjoys the courtroom dramas should be too. The Phoenix Wright games consist of going through courtroom cases, investigating crimes, and questioning potential witnesses/criminals. The characters are usually outrageous charicatures of the type of character you’d see on any hour-long procedural crime drama on television these days. I have found that the most enjoyable aspect of the Phoenix Wright experience is the process of questioning these characters and finding my way to the truth. 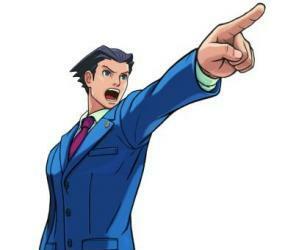 In this way, Phoenix Wright: Ace Attorney is going to offer iPhone gamers so much more than the other adventure games currently available. 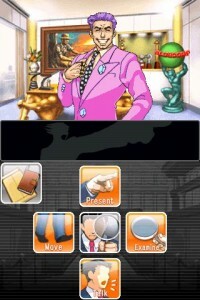 When you see that Phoenix Wright: Ace Attorney is available for purchase from the Appstore, I urge you, buy it immediately and prepare for the most enjoyable adventure game experience on the iPhone – or any platform – you’ll ever have. For this port, Capcom kept the original dual screens. But all actions are, obviously converted to Apple’s device. 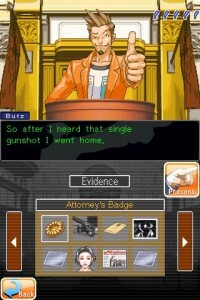 I’m happy to see this arrive on the iPhone and here’s hoping to see more Phoenix Wright and Capcom games being ported. Speaking of which, where is that Cammy update for Street Fighter IV iPhone? ?